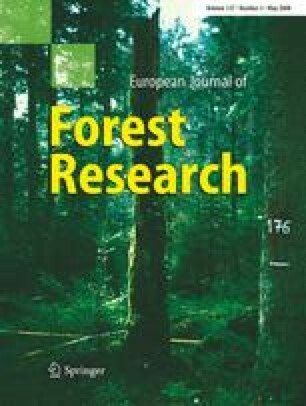 Three different methods were evaluated for analysing wood formation of Norway spruce [Picea abies (L.) Karst.] and Scots pine (Pinus sylvestris L.) in Finland. During two growing seasons, wood formation dynamics were determined both by wounding the cambium with a needle followed by localisation of the wound-associated tissue modification after the growing season (pinning), and by extracting small increment cores during the growing season (microcoring). Stem radius was additionally monitored with band dendrometers. For Norway spruce, pinning and microcoring yielded similar dates for the onset of wood formation. The timing of wood production during the growing season was also similar for pinning and microcoring. For Scots pine, the onset of wood formation was recorded from microcores almost 2 weeks later than from pinning samples. In Scots pine, microcore measurements also produced somewhat later cessation dates for tracheid formation than the pinning samples. For both tree species, the total number of tracheids formed during the growing season was, however, about the same for pinning and microcoring. Dendrometer results clearly differed from those of pinning and microcoring. In particular, the dendrometers showed an increase of stem radius considerably earlier in spring, when the other methods did not detect wood formation. Thus, pinning and microcoring currently represent the most reliable techniques for detailed monitoring of wood formation. We are greatly indebted to Tarmo Aalto, Tapio Huttunen, Laura Kärki and Tanja Potsch for their skilful technical assistance, and the staff of the Kivalo research area for their careful field sampling.